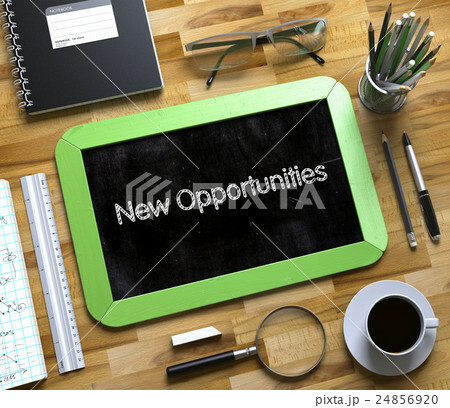 New Opportunities Concept on Small Chalkboard. 3D. イラスト素材: New Opportunities Concept on Small Chalkboard. 3D. New Opportunities Handwritten on Green Chalkboard. Top View Composition with Small Chalkboard on Working Table with Office Supplies Around. Small Chalkboard with New Opportunities. 3d Rendering.